The PMPA Business Trends Index showed a surprisingly strong August. 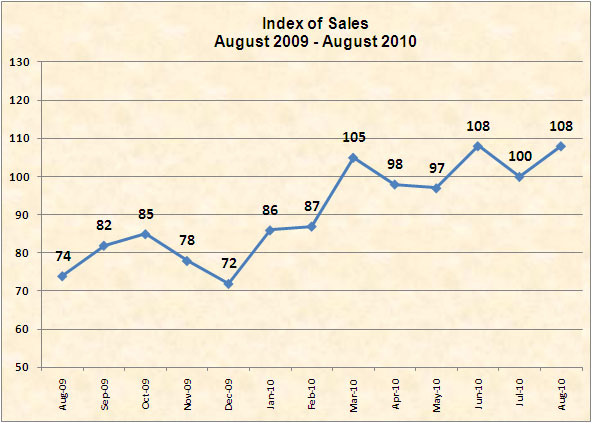 PMPA’s Index of Sales of Precision Machined Products in August 2010 climbed to 108, a surprisingly strong showing. The 8 percent increase in industry sales helped August to tie with June for the Sales Index High of the year to date, and since May 2009. August is the 6th month of what we have termed the new normal of sales at the Year 2000 baseline. August 2010 is up 34 points over August 2009. Two thirds of our respondents reported single or double digit gains in sales in August. Members can download the full report here. This entry was posted on Thursday, September 23rd, 2010 at 9:56 am and is filed under Front Office. You can follow any responses to this entry through the RSS 2.0 feed. You can leave a response, or trackback from your own site.